The village is recorded in the Guinness Book of Records as the oldest continuously inhabited settlement in the country. People have lived here since prehistoric times: The Mesolithic village, discovered near the Sewage Works in Lower Way Lane, being of particular note as one of the finest temporary settlements of nomadic hunters ever found. Hearths and flint knapping floors were uncovered, as well as flint and even bone tools, and the remains of numerous animals, including elk, beaver, wolf and pine marten! The first settlement of any size appears to a been a Roman wayside village in the area around Bath Road/Northfield Road/Henwick Lane. It spread along the Ermin(e) Way between Cirencester and Silchester, just north of where it spanned the Kennet. This important river crossing seems to have possessed an actual Roman bridge, as opposed to the more usual ford, for it is mentioned in an old Saxon charter as 'Welshman's Bridge' (ie. Romano-Briton's Bridge). It probably stood somewhere near the present Quaking Bridge. A curious archaeological find from the area is the skeleton of a man, his horse and what appears to have been his chariot, complete with iron banded wheels, discovered at Colthrop Mill. He presumably came off the road in some accident and drowned in the swamp which then existed in the area. The village itself has produced numerous finds including parts of leather shoes, oyster shells, metal drinking vessels and much pottery. However, of actual structures, only a few dry stone foundations, roof tiles, a hearth and a 3ft deep boundary ditch have been identified, so the habitations were probably largely of wooden construction. A number of wells - one with a wooden shelter - have been excavated and the most dramatic find from the site, so far, was discovered in one which was 12ft deep: a large hoard of pewter. This prized collection of tableware was probably hidden in times of trouble in the early 4th century. There was a flagon, two shallow bowls, a deep bowl, an oval dish and a flat plate. They seem to originally have been placed under lock and key in a wooden box. Perhaps of more interest though are the pieces of bronze, iron slag and coal which indicate that Roman Thatcham was an industrial settlement of some sort. Although there were also items of a more agricultural nature: an iron meat cleaver, a pair of shears and a millstone. The settlement was occupied between at least the middle of the 3rd century and the late 4th century, but its name is unknown. In the late or immediate post Roman period it is just possible that it was referred to as the Hen-Vicus, a Celtic phrase meaning 'Old Town' which survives today at Henwick, near Ashmore Green. Celtic place-name survivals such as the two mentioned above may indicate that old Roman Thatcham had not been completely abandoned during the troubled times of the 5th century. In the next hundred years, Saxon settlers probably arrived up the Thames and the Kennet. It was not unusual for them to set up home on the edge of old Roman estates. Hence one group chose land to the west of the old settlement, on the higher ground around the present parish church. The place is traditionally thought to be named after the Thatched-Homes of these first Saxons and there is a charming old story about how the village could easily have become Tileham instead. A less exciting interpretation suggests that these were the homes of the followers of a man named Thaec. Unfortunately, little is known of Saxon life in Thatcham, but the place seems to have been of some importance. Thatcham Church was a Saxon Minster which may have been founded by St. Birinus in the 7th century. Its parish probably once encompassed the whole of the local hundred of Taceham. The hundred court apparently met at the ford over the Kennet where the Swing Bridge now stands. The place was called Cottlesettle Ford from at least the 14th century. By AD 971, the manor was in the hands of the Aelfeah (alias Alphege), the Ealdorman of Hampshire. He was an important official and cousin of the wicked Queen Aelfthrith, but probably rarely visited Berkshire. He would have lived in Winchester. In his will, he gave Thatcham to his friend, King Edgar the Peacemaker - freeing all his slaves there into the bargain - and it remained a Royal manor for the next hundred and fifty years. By the time of the Domesday Survey, instigated in 1086 after the Normans had taken over the country, of the Berkshire hundreds, Thatcham (or Taceham) was second only to Old Windsor. The 'town' was inhabited by thirty-five villeins (semi-free labourers) and twelve cottars (smaller cottagers), but these were only the heads of the households and there could have been upwards of 250 people there. Some of them, paying rent on twelve hagae (town houses) were presumably freemen. The population owned 25 ploughs (and their teams) for cultivating the land, but there was also 147 acres of meadow, and woodland that could support some sixty pigs. There were two mills and the church had two priests. This very prosperous manor was bringing in an income of £34, compared with Greenham and Midgham's £6 each (and others of considerably less). In 1125, King Henry I granted the manor of Thatcham to his new foundation of Reading Abbey. Thus the all powerful Abbots became lords of the manor and, as well as being exempt from taxes and having the right to hold their own manor courts , they were allowed to hold a Sunday market in the church. It was during this period that Thatcham became the great rival of nearby Newbury, a 'new town' set up soon after the Norman Conquest. Henry II issued three charters confirming Thatcham's market and compelling the men of Berkshire to attend, but the Newbury townsfolk became jealous and attacked the Thatcham merchants, overturning their stalls and scattering their wares. The King immediately ordered that the Newbury folk restrain themselves; but the animosity between the two towns remained and this was not helped by a further grant, in 1222, for a fair in Thatcham, to be held on St. Thomas A'Becket's Day (7th July). In 1304, a chapel to this saint was erected on the Bath Road where it can still be seen today - although subsequent to being the Bluecoat School, it is now an Antique Shop. Around the same time, the town's prosperity was reaching its peak and the Abbot of Reading, being in financial difficulties, appears to have used his influence with King Edward I to gain borough status for Thatcham. The incorporation charter no longer exists but, by the early 14th century, Thatcham was certainly one of the 'four boroughs of Berkshire'. However, Thatcham was a town of small cottage industries: wood turning, coopery, milling and various cloth making activities. Many inhabitants were also agricultural workers. After the Black Death devastated the population in the late 1340s, decline set in. Unlike Newbury, no great entrepreneurs emerged to create great cloth-working factories in the Tudor period, despite the decsendants of 'Jack O'Newbury' being granted the manor of Thatcham upon the Dissolution of Reading Abbey. The town's hey-day had long past. Jack O'Newbury's son, John Winchcombe, divided the manor in two: the urban borough and the rural manor with its house at Henwick, but the family lived mostly in Bucklebury. During the Civil War, the parliamentary army spent the night before the 2nd Battle of Newbury at Thatcham. There was a skirmish with some of the Royalist forces and 20 horses were killed, but no men. In the 1720s, the manors were confiscated from the treacherous Viscount Bolingbroke and eventually sold on to General Waring, who had served under William III and the Duke of Marlborough. He built a fine mansion for himself, called Dunstan House, and planted the park with trees lined up according to the troop positions in the battles in which the General had fought! His descendants sold up in 1798 and the house was demolished soon afterwards. It was around this time that Francis Baily began to rise to fame as a renowned astronomer. Although he grew up in Newbury, he was from an old Thatcham family and was eventually buried in the family vault under the parish church. Meanwhile, Thatcham's prosperity had been given something of a boost by the improvement of West Berkshire's communications network. The Bath Road was becoming a major thoroughfare, highly used by passenger and then mail coaches. 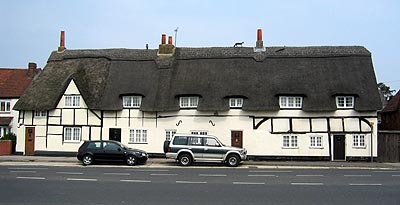 About 1720, the Theale to Speen Turnpike Road was opened and twelve of the forty or so coaches, which passed through Thatcham, stopped there at the White Hart, King's Head and Cooper's Cottage. The famous Thomas Cooper operated his own coaches from the latter. The first ever mail coach run took place in 1784, and its horses were almost certainly changed at the King's Head. Transport was further improved with the opening of the Kennet Navigation Canal in 1723; and this was linked to the Avon, as the Kennet & Avon Canal in 1810. The Berkshire & Hampshire Railway followed in 1847. However, improvements could also bring troubles. In the late 18th century, improved agricultural methods led to a great increase in land enclosure. Small landowners became employed labourers; but wages were low and, in 1800, three hundred people gathered in Thatcham with the hope of forcing a local increase. These 'Food Riots' were soon dispersed by the Thatcham Volunteer Cavalry Corps who had been formed in order to counteract a possible French invasion. Thirty years later, increased mechanisation was causing mass unemployment and there were ugly scenes at Thatcham during the winter of 1830. Many of the village workers were involved in the local Machine or Swing Riots of the time. An angry mob of some three hundred men marched on the vestry to demand jobs and pay increases. They were received in friendship, but little hope was held out for the meeting of their requests. The next day they marched on Bucklebury, smashing farm machinery as they went. See also Ashmore Green, Cold Ash, Crookham, Greenham & Midgham.